Ah Seng Durian stall is a great example of how durian stalls can differ in Singapore. They write articles online educating and explaining to members of the public the different durian variations. 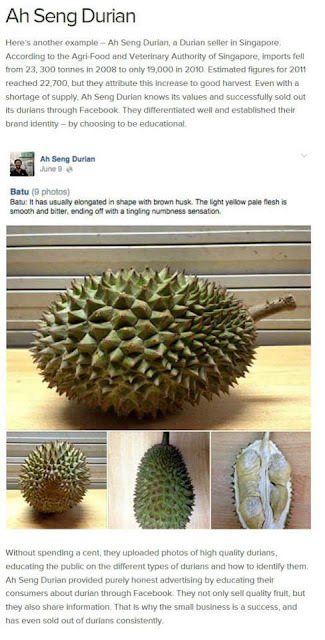 They upload photos and explanations about durians and how to identify them. They are true to their values and are honest about their durians and inform them when they are out of stock, so consumers do not waste time heading to their stall and missing out on their favourite durian types. Ah Seng Durian knows its values and successfully sold out its durians through Facebook. They differentiated well and established their brand identity – by choosing to be educational. They are a great content marketing works in Singapore, where you educate, show trust and genuinely care about your customers. In turn, they will follow and support you. Great job Ah Seng! If you are reading this article looking for durians, Ah Seng's durian stall address is below. Happy Durian hunting! If you're keen on finding out more examples of content marketing success stories. Visit SearchEngineJournal's article on the topic, "Why Some Businesses Generate Higher Social ROI, While Others Waste Money".